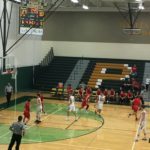 Marquette, MI – December 4, 2018 – Marquette Redmen Boys Basketball was on the road again this week. This time they took on the Green Bay Preble Hornets at Green Bay. 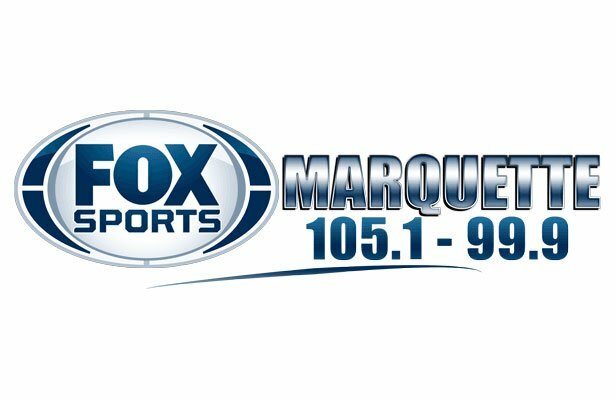 Fox Sports Marquette 105.1-99.9 had all the action. Wisconsin does things a little differently. They play halves instead of quarters with each half at 18 minutes long. The first half saw the Redmen fairly evenly matched against the Hornets, though Marquette often had the upper hand. However, with a 30-26 Redmen lead and only a few minutes left on the clock, the Hornets pulled out in front to 33-30. Marius Grazulis clinched a fadeaway jump shot for two, plus a chance at the line. Grazulis secured one of two free throws to tie it up at 33-33 going into the half. Marius Grazulis was the leading scorer at the half with 14 points. Not too far behind was Raffy Millado with eight points, and Bryce Brazeau had four. The Redmen try to swat away the Hornets. The Hornets pulled out in front again at the beginning of the second half. Raffy Millado brought it back to a tie at 40-40 with a three-pointer for Marquette. The Redmen soon enjoyed a modest lead but, as in the first half, the Hornets continued to pester Marquette. 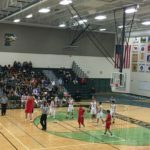 At 57-47, the Hornets began to pull away from the Redmen with a little more than 10 minutes to go in the half. Plenty of time for Marquette to come back, but a concerning lead from Green Bay. 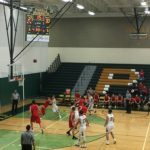 The Hornets protected their lead for a little while, but an Ethan Martysz three-pointer slashed it to a two-possession game for the Redmen. The Hornets again pulled away. Martysz performed the same magic with another three a few minutes later to tighten an eight-point deficit. Green Bay would not go away, however, and the second half continued to prove much more problematic for Marquette than the first. 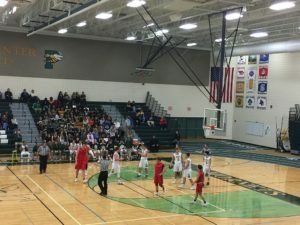 There was another Redmen three-pointer from Marius Grazulis, but Marquette continued to struggle to stop the Hornets on their end. 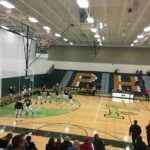 At the buzzer, Green Bay Preble had kept Marquette at bay and sealed a Hornet win. Marius Grazulis had a game high scoring record of 28 points. Other top Redmen scorers were Raffy Millado, improving to 15 points, and Bryce Brazeau ended up with 9 points overall. The final score was 79-70. Green Bay Preble. 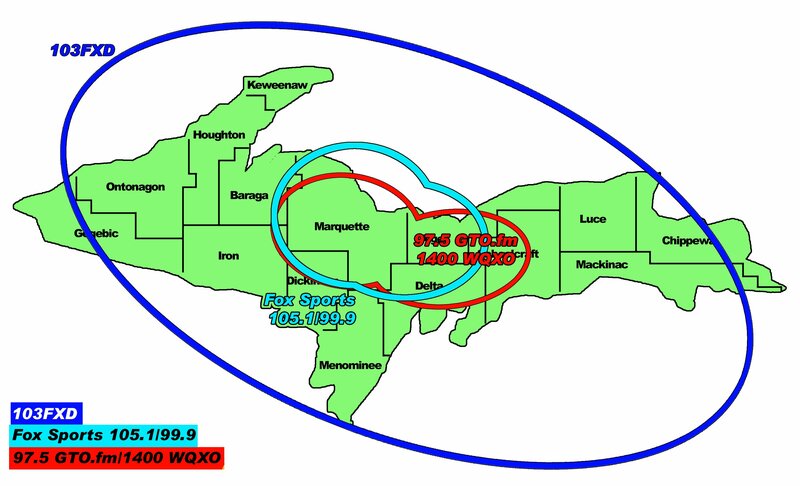 The Marquette Redmen Boys’ Basketball team will be in Gladstone to take on the Braves on Tuesday, December 11th. Pregame starts at 7:00 pm and tip off is at 7:30 pm on 97.5 GTO. 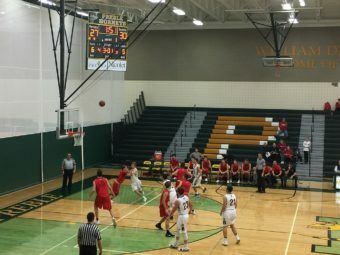 The Marquette Redmen were on the road against Green Bay Preble. 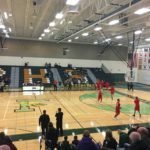 Marquette took on the Green Bay Preble Hornets. The Hornets warm up for their bout against the Redmen. The Redmen prepare to take on the Hornets. 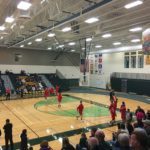 The Redmen warm up on the Green Bay Preble court.